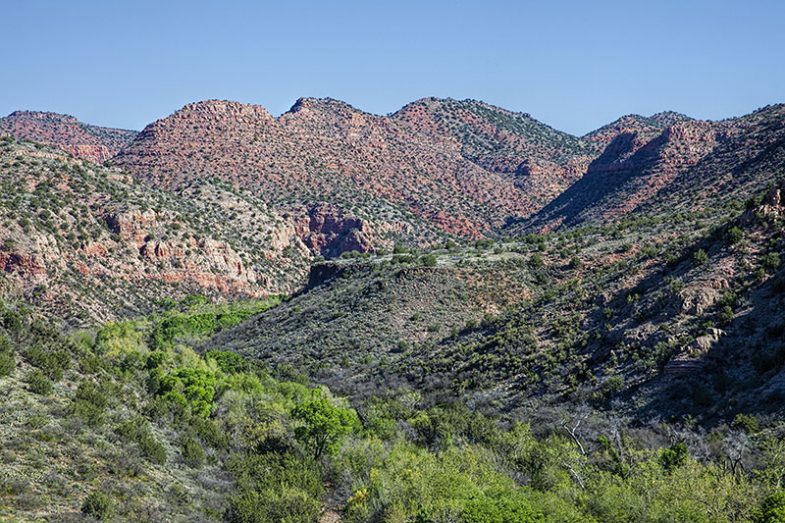 Sycamore Canyon Wilderness in central Arizona. The most significant land owner in the Verde River watershed is the American people – federal public lands make up 62% of the total land area in the watershed. The majority of federal public lands in the Verde watershed are U.S. Forest Service lands, managed under the U.S. Department of Agriculture. The Prescott National Forest encompasses 1.25 million acres, largely along the southern area of the upper and middle reaches of the watershed, and on the northern end of the watershed lies the 1.8 million-acre Coconino National Forest. The lower reach of the Verde River watershed flows through the Tonto National Forest to the south. These are three of the six National Forests located in Arizona. The management of these lands for multiple use, including recreation, grazing, timber production, and conservation, plays an important role in sustaining important watershed services for the Verde River. The National Park Service manages a number of National Monuments in the Verde River watershed that protect some of the best archaeological resources of the ancient Sinagua culture that lived in the Verde watershed over 1,000 years ago. Tuzigoot National Monument features an ancient Sinagua pueblo hilltop dwelling located near the Verde River and an important adjacent wetland, Tavasci Marsh. Montuzuma Castle National Monument protects a remarkable Sinagua cliff dwelling, and Montezuma Well National Monument protects ancient ruins and an irrigation ditch dating back to the earliest known human settlements in the region. A number of other federal agencies operate within the Verde River watershed, and while these agencies do not manage public land units, they provide other services that range from wildlife protection and water resource management, to geological and hydrological data collection and research studies.